Before we have wrote an article about High Density Cleaner, some readers showed great interests about this pulp equipment, and they asked a lot questions about it. Therefore, today this article will answer them for readers. What Paper Pulping Line Can High Density Cleaner Apply to? High Density Cleaner is mainly used for removing heavy impurities in slurry. It can not only clean all kinds of waste paper pulp, but also apply to the wood pulp. Therefore, it’s a quite widely used cleaning machine in paper mill. It usually handles with the slurry after pulped by D Type Hydrapulper or Drum Pulper. Does High Density Cleaner Need a Motor? High Density Hydrapulper depends on the effects of gravity and centripetal force, and it doesn’t need a motor. Generally by adjusting the throughput to control the pressure difference, so that the force is accordingly controlled.The input pressure is 0.35Mpa, and the pressure difference is 0.05-0.1Mpa. The silver part is 304 stainless steel; the paint spraying part is carbon steel; the two liners are made of ceramics. Automatic slagging valve reduce manual work. Equipped with the PLC control cabinet, more same and convenient. 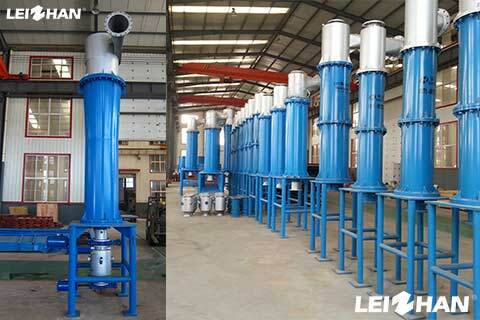 Less loss of fiber, so the impurity can be directly removed and don’t need a tail slurry recycling device.